One of AFTN’s favourite times of the year is with us again as the 2015 BC Provincial Cup kicked off this past weekend. This year’s action got under on Saturday and Sunday with eight Keith Millar B Cup preliminary round matches and as the action heats up on the way to the Finals in Langley on May 10th, AFTN will be following the action every step of the way once again, with reports, photos and videos from all the rounds in both the A and the B Cups and on Finals day itself. One sure fire way to get us to cover a large selection of matches is to play them ten minutes from my house! What that meant for the kickoff weekend was that we were able to cover three of the Sunday games played at Vancouver’s Trillium Park. 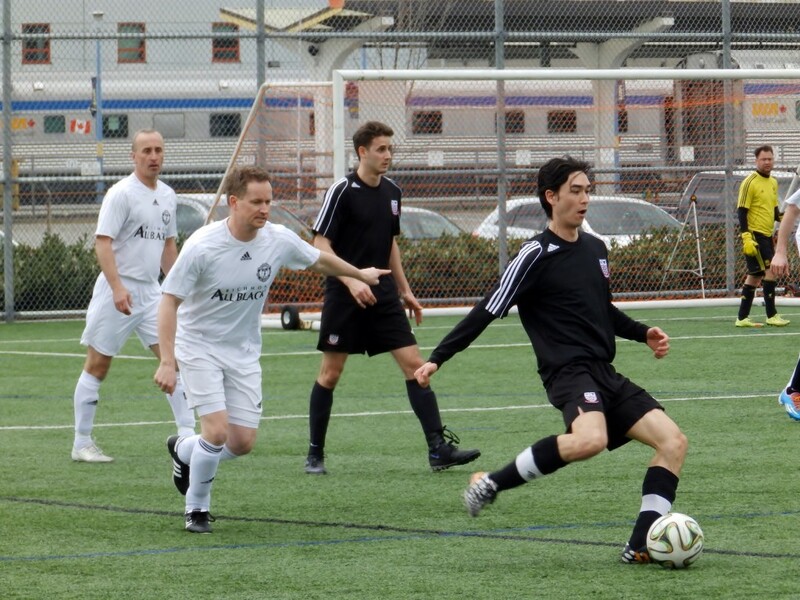 Kicking things off was an intriguing clash between Vancouver Metro Soccer League Division 2B runners up Gastown FC and the Richmond Adult Soccer Association (RASA) Premier Division runners up, Richmond All Blacks. Richmond won the B Cup in 2013 and lost last year’s final to South Burnaby Fighting Irish, and they were fairly untroubled in their quest to regain the trophy in a 2-0 victory. Gastown made most of the early running, with Jeroen Bart having the first real chance of the game seven minutes in when he fired wide right from just outside the box. Oscar Salvador was next to have a go for Gastown, but his low shot was saved by the All Blacks keeper Peter Proctor. It was to be Richmond who opened the scoring though in the 16th minute when Ming Choy rose unchallenged to head home an Alan Tso free kick from six yards out. When Nan Yang was played in and beat the onrushing Gastown keeper, Carl Ostridge, in the 33rd minute to make it 2-0, it looked like a tough ask for the VMSL side to get back in to things, and so it proved. Craig Shirra had a chance to pull one back for Gastown two minutes before half time but Proctor was out quick to smother the chance and when Mike Roger’s fierce shot flew past the right post just past the hour mark, you got the feeling it wasn’t going to be Gastown’s day and the former champs held on quite comfortably in the end without pushing too hard to increase their tally. One interesting side note to come out of the game was that the officials had incorrectly told the coaches that there were to be only five subs in the game instead of unlimited. The assistant referee was corrected on this by Richmond coach Kyle Shury during the first half but the information wasn’t relayed to Gastown coach Owen Parrott until later in the half and after the All Blacks had made four subs to their none. Richmond All Blacks now advance to face Burnaby Mens Soccer League (BMSL) Persia FC at Burnaby Lake West on Sunday afternoon at 2.30pm. 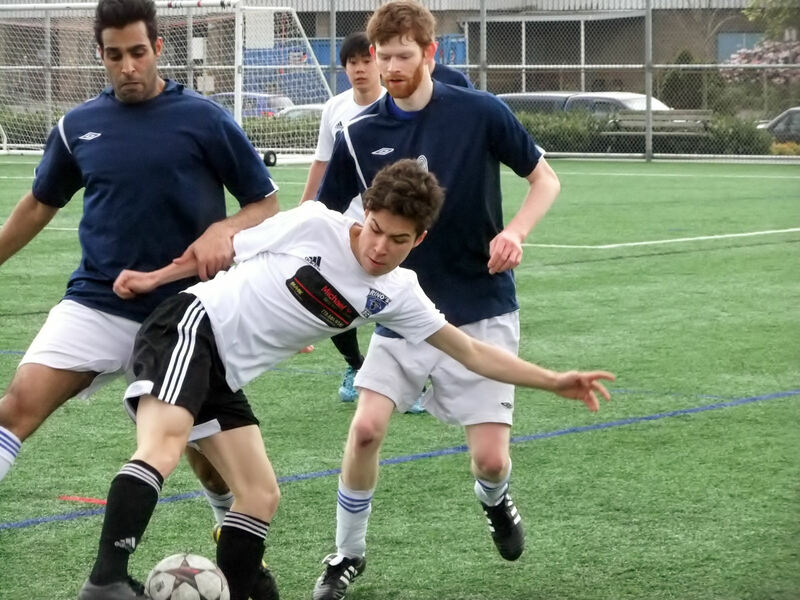 While Gastown FC and Richmond All Blacks were battling it out on the Trillium West pitch, there was a VMSL v FVSL (Fraser Valley Soccer League) match-up going on at the same time on Trillium East, as Twin Arrows hosted Aldergrove Red Devils. We tried to keep track of both matches as best we could and in the end it would appear that we chose the wrong one to primarily follow, as Twin Arrows fought back from being down 3-0 to set up a frantic finish against Aldergrove before losing out 3-2. Twins Arrows were runners up in Division 3A of VMSL, but qualified for the Provincials on the back of being beaten finalists in the VMSL Division 2 Cup, with winners Guildford FC having already qualified as Division 2A champs. Aldergrove finished third in FVSL Division 2. It was Twin Arrows who came out of the traps fast, however, and they had a great chance to open the scoring in the first minute when Ali Pickett raced clear on goal but Aldergrove keeper Atilla Davalovsky rushed out and came up with a massive save. A super early game changer? Perhaps. But Aldergrove settled and took the lead through Eric Vanderhoek in the 11th minute, with their first chance of the game. Hard to tell how the rest of the half went as I was mostly watching the other game, but most of the time I looked over the ball was in the Aldergrove half. This may not be a fair reflection! The Red Devils doubled their lead though in the 55th minute when Anthony Fragoso fired home from the spot, sending Twin Arrows keeper Brennan Baker the wrong way. Aldergrove made it 3-0 in the 70th minute through Ryan Miller and it looked game over before Twin Arrows made a storming comeback in the closing minutes of the game. The VMSL side pulled one back in the 85th minute through Daniel Jansson, with Aldergrove looking for the offside, and then a stunning goal made it 3-2 in the 90th minute, when the ball bounced around the box before it broke to Monir Pejgaleh and he back flicked the ball over his head and into the top corner. Just wish we’d caught it on camera. Twin Arrows had pushed hard but just couldn’t force extra time and Aldergrove now advance to face Guildford FC. 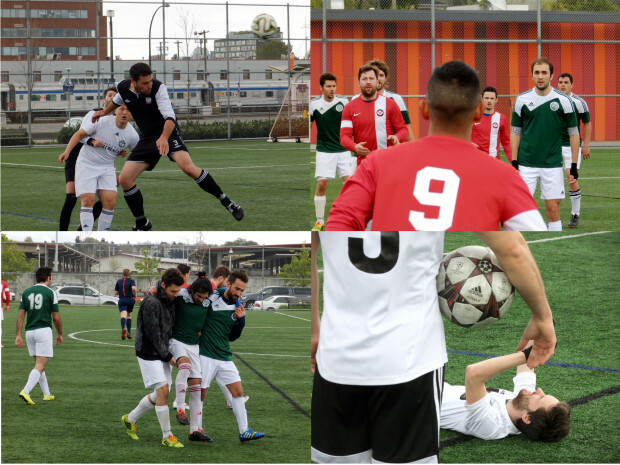 Our feature match of the weekend was our good friends at Rino’s Fury FC as they hosted BMSL side Burnaby Hotspur. Well I say friends, we’re expecting a banning order now since we’ve watched them in their first Provincial Cup match for the past three years now and they haven’t won one yet so we’re clearly a jinx and apologise! 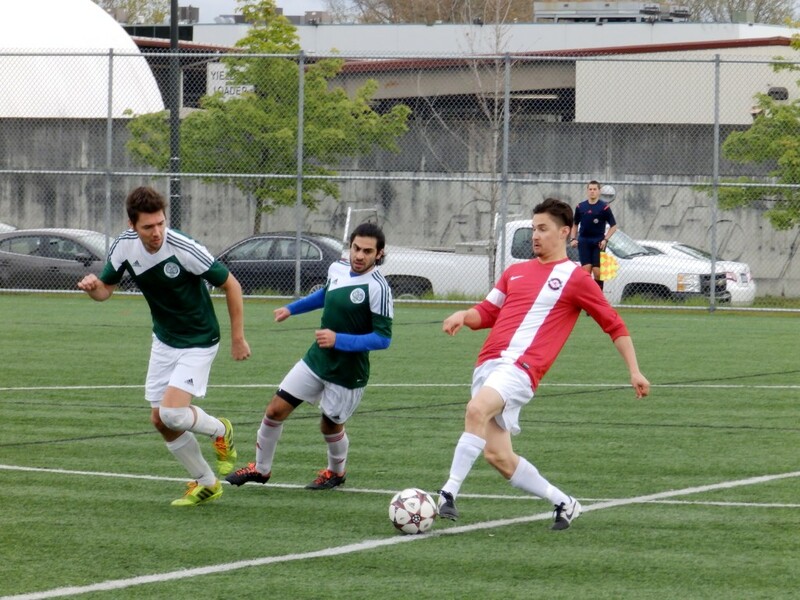 Rino’s Fury finished third in the VMSL Division 2A standings this year, while Burnaby Hotspur finished 7th in the BMSL First Division but qualified for the Provincials on the back of winning the BMSL League Cup at the end of March. It was a pretty uneventful first half, with both teams feeling each other out. Rino’s had the first real chance of the game in the 29th minute when Alessandro Pace forced a save out of the Hotspur keeper. The rebound fell to Yuda Shih but he blasted over from inside the box. Burnaby’s best chance of the half came two minutes later when Ahmad Al-Ashkar cut the ball back to David Kliewer, but his flighted shot landed on the roof of the Fury net. So goalless at the half, but the game was to liven up pretty quickly in the second. Hotspur thought they had taken the lead in the 53rd minute when Ibrahim Al-Ashkar fired home after latching onto a rebound after his brother Ahmad’s shot had been parried by Fury keeper Patrick Hayward, but the goal was ruled out for offside. It was just to be a temporary reprieve for Rino’s and Burnaby opened the scoring three minutes later, and it was the same players who were involved, with Ibrahim heading home Ahmad’s free kick. The Hotpsur lead was to be short lived and Fury equalised in the 59th minute later when Guy Packham poked the ball home from close range after a scramble in the box. The game was pretty open now and Fury hit the post in the 67th minute as they pushed for the go-ahead goal. That was to come for Hotspur five minutes later and it was to be Ibrahim Al-Ashkar in the thick of the action once again, sending a brilliant pass through to Corey Sanford who slotted what was to prove to be the winning goal past Hayward. Fury went forward looking to tie things up once more and had a couple of chances and forced several corners, but Sanford nearly gave Hotspur some breathing room with an effort from outside the box that flew wide right with 12 minutes remaining, before Nathan Kung brought a good save out of Hayward a minute later. The Burnaby side saw out the remainder of the match fairly comfortably and now move on and travel to face FVSL side Langley United Sparta on Saturday evening, kicking off at 8pm at Willoughby Turf. You can find the schedule for all of this weekend’s matches in all of the Cups over at the BC Soccer website HERE. Try and get out and see some matches if you can and #SupportLocalSoccer.